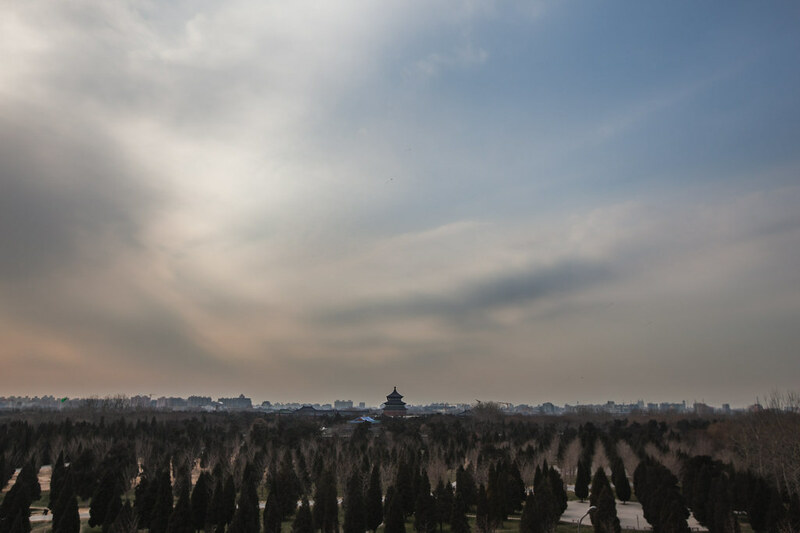 With the odd day or two of smoggy air, the last month have brought unusually clear skies to Beijing. The city is a different place when the air is clean. From smiley faces on the streets to chummy taxi drivers, you can feel the people of Beijing draw a collective sigh of relief. And no doubt most Beijingers enjoyed a moment of schadenfreude as Shanghai reached record breaking pollution levels a few weeks ago. Perhaps the liquid nitrogen is already working its magic. On a beautiful day earlier this week, I stopped by the Hongqiao Pearl Market across from the Temple of Heaven. They have a balcony with great view of the park. Above is a shot from the late afternoon.